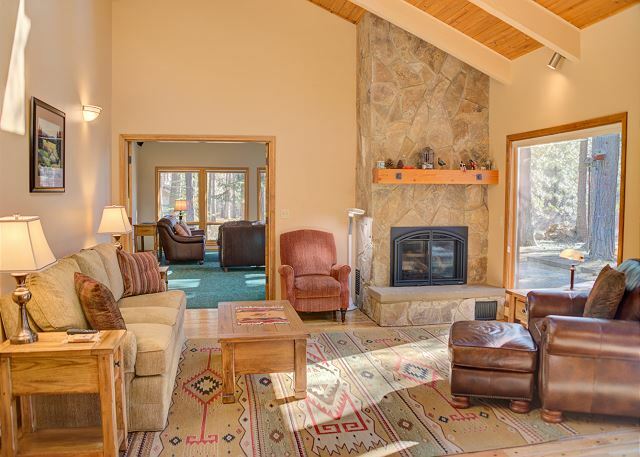 This spacious vacation home (2,643 sq. 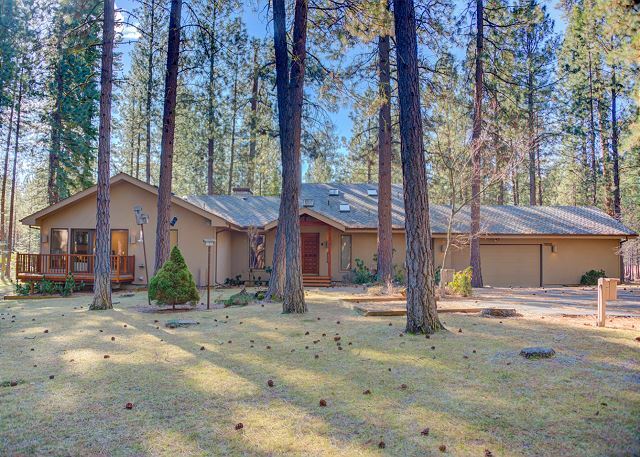 ft) sits on a beautifully landscaped home site with large Ponderosas and vine maple, a perfect habitat for abundant birds and wildlife. 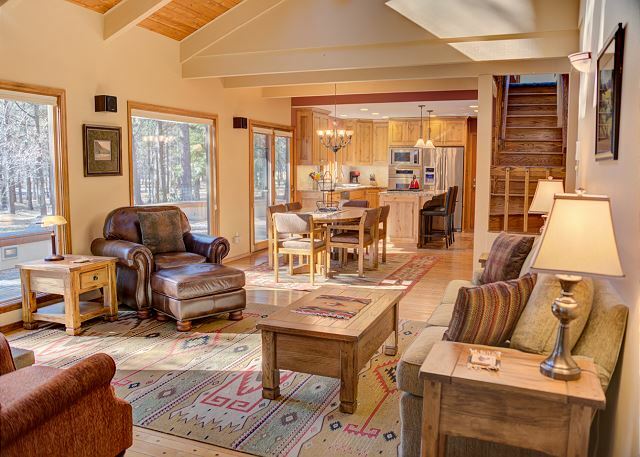 The back deck is large, private and very inviting, bordering forest land. There are multiple bird houses and nests and you will never tire of watching the abundant birds and wildlife. 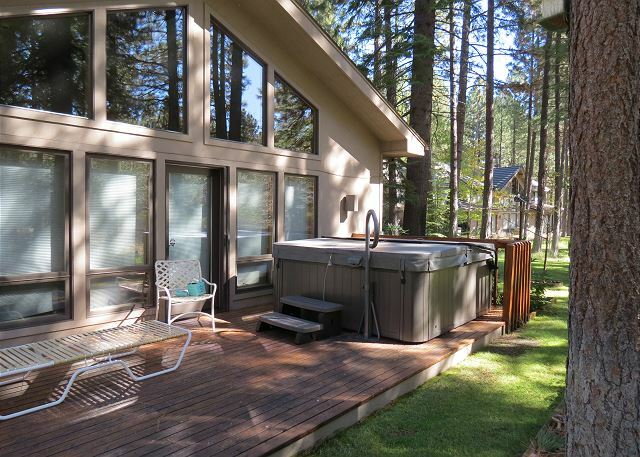 This home is within a short walk or bike ride to the Glaze Meadow rec area and the Glaze Meadow Pro Shop. 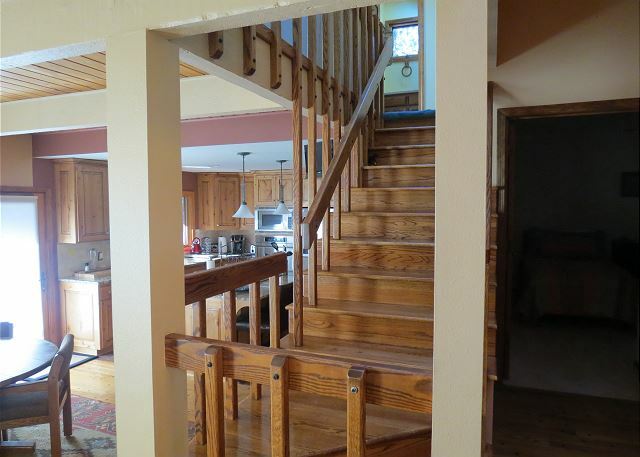 Walking into the grand entrance of this home, you can see the welcoming open concept of the kitchen, dining room and living room, all open, and all which look out to the forested view and beautiful back yard. There is a wood burning fireplace in the living room, floor to ceiling windows, hardwood floors, and comfortable leather furniture. The dining area has a large table and is adjacent to the kitchen. 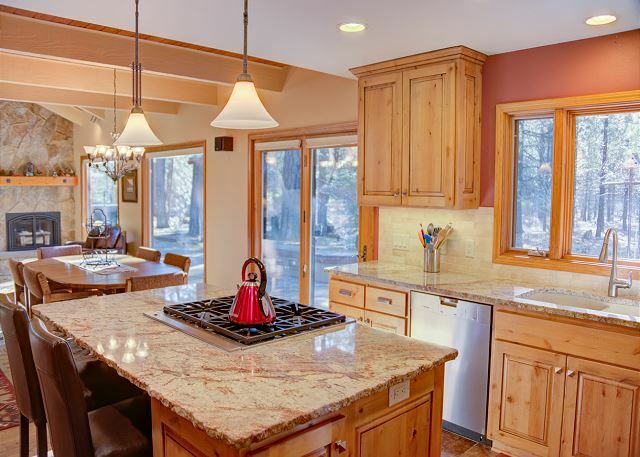 The kitchen has a large island and miles of granite counter space and lots of cabinets. It is fully equipped to make even the most discerning cook happy and content as they cook away from home. There is a spacious family room off the living area and master suite, which is the main television viewing area and has a hidebed couch for extra sleeping. 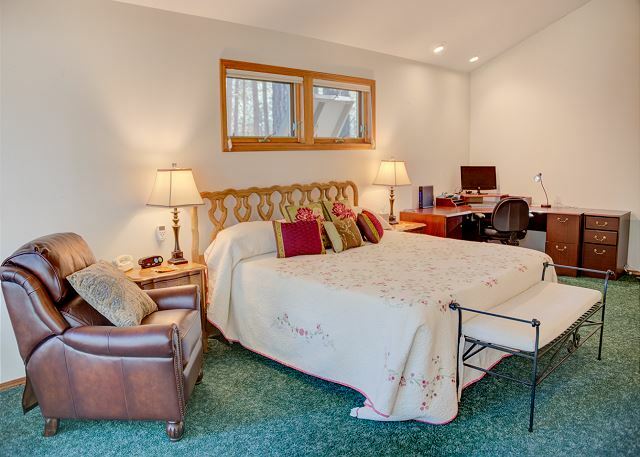 The king master suite is adjacent with a large walk-in closet and master bath with a walk-in shower and double vanity. 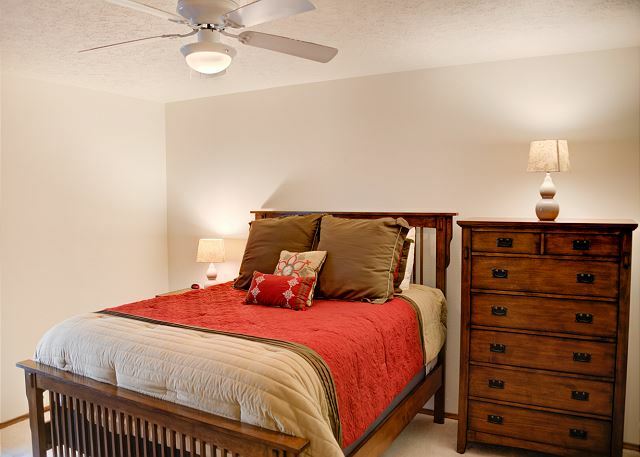 The master bedroom also has its own private deck to enjoy the lovely, landscaped front yard. Off the entry are two bedrooms, one with twin beds and one with a queen. They share a bath in the hallway with a shower. 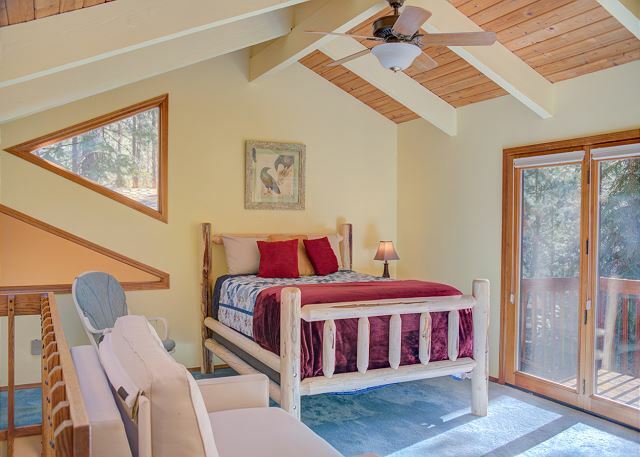 Upstairs is a second queen bedroom with adjacent bathroom, also with a shower. There is a single futon for extra sleeping in this room. This wonderful vacation home also offers a large hot tub on the back deck, is air conditioned and allows your dog to vacation with you! You will want to return again and again to this most perfect family home. A great multiple family house. Very convenient to have two separate “living room” areas for different activities. This house worked very well for us and our 3 children with their spouses. Thank you for allowing pets - it’s just not family without them 😊. We will return! 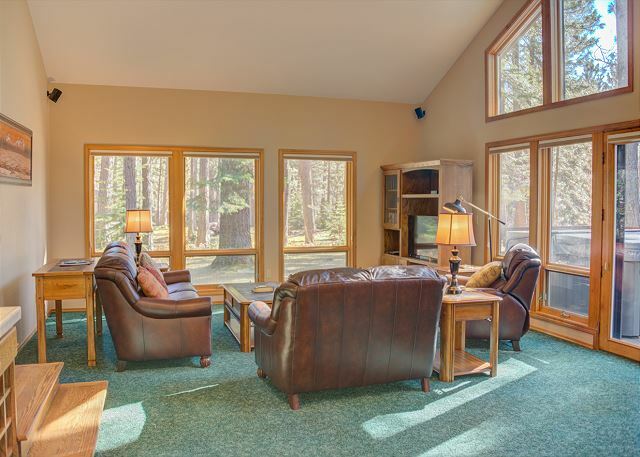 Glad to hear you enjoyed the home and your stay and Black Butte Ranch! We recently stayed here with extended family over Thanksgiving. I have stayed in many rental properties from Florida to Hawaii and this by far was the most well stocked house of all. My only recommendation would be to provide pillow cases for the extra pillows! Thank you for your review, and we are so happy you enjoyed your stay. We will definitely make sure the home has enough pillow cases for all the spare pillows. Thank you for letting us know. Thank you so much for your review! We are delighted to hear you enjoyed the home. House was great for the our family. A lot of dog hair in the two rooms with green carpet, but overall a nice home. Loved we could bring our dog. Would definitely stay here again. Thanks as always to HRG for their great customer service! GM 236 provided an ideal setting for our growing family. Our adult children,their spouses, and the four young granddaughters had plenty of room to relax and enjoy this lovely home. Since we're golfers, we loved the location which is less than a block to GM golf course. The GM recreation area is less than a mile away. Kitchen is very well equipped. Hot tub was an added treat. There are essentially two living rooms and when you shut the double doors between them, it's very quiet on the other side. We occupied the spacious master suite complete with bathroom, vanity area, walk in closet, and small deck. All three couples agreed, without a doubt, that we'll be returning next summer. Wow this was a five star experience. The house is extremely well stocked (the kitchen was amazing) and we loved how they made our pooch feel very welcome (the basket with dog goodies was a wonderful touch). This open and inviting home is perfect for large families. The kitchen is also well equipped. 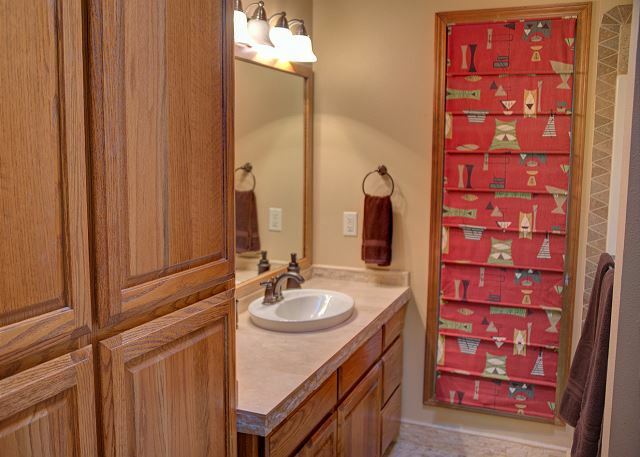 You can tell that the owner loves this home. We were very satisfied with our experience. Clearly the owners are dog-friendly which we appreciated, as did our dog who enjoyed the treats from the welcoming treat basket. The house is very comfortable and lovely and very well situated for dogs as one can walk out the back door and go directly into the woods for a great walk( being careful not to get lost). We would have liked to have filled out a guest book for the owners, something you might add. All-in-all a delightful experience, and should we come back to Black Butte in the future we would definitely like to stay there again.